FRAMED PRINT. 22x18 inch (56x46cm) Framed Print with Black Satin with Off-White Digital Mat. 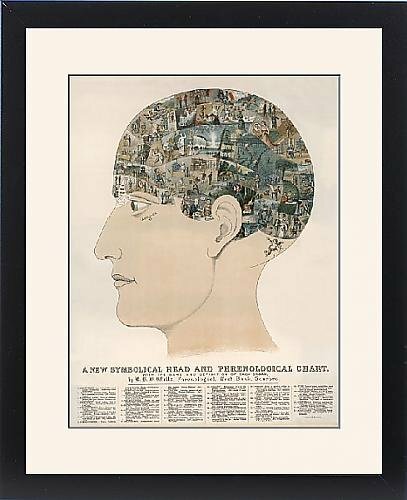 Artwork depicting PHRENOLOGICAL HEAD. A PHRENOLOGICAL HEAD Symbolic representation showing 37 areas such as eventuality, individuality, self-esteem, secretiveness. Shipping from USA. Artwork Description... A PHRENOLOGICAL HEAD Symbolic representation showing 37 areas such as eventuality, individuality, self-esteem, secretiveness.